Here is the third lesson in my Mom's Missionary Training Center. We did these lessons in November, so many of my lessons corresponded with Thanksgiving things we were doing as well. It worked out great for us but these lessons should work for any month of the year. If you would like to read more about how I implement these lessons in my home please read this post. D&C 59:7 "Thou shalt thank the Lord thy God in all things"
or James 4:10 " Humble yourselves in the sight of the Lord, and he shall lift you up." Help children understand that Jesus was the Son of God, the greatest person to ever live on the earth, but that he was humble enough to do the job that a servant would normally do. He wanted us to understand that God measures greatness, not by the amount of money or power you have, but by how willing you are to serve and love others. When we humble ourselves and serve and love those around us we become like Christ and become great in the eyes of God. Why did Jesus wash the feet of his apostles? Why didn't Peter want his feet washed? Would you have let Jesus wash your feet? Who can you show love and service to? How are you going to love and serve them? Begin by explaining that being proud is thinking that you are more important or more valuable than others. Prideful people are also known for walking around with their “noses in the air.” They think so much of themselves that they look down on others and can't see other people's needs or feelings. Set up a trip line in the room, make it low to the ground (about ankle height). This can be done by tying a string between two chairs. Take turns having the children say proud statements, like "I am the most beautiful person in the room", or "I am the best at playing basketball, no one else is as good as me".Have the kids practice walking around with their noses in the air when they say these things. It helps if you demonstrate first and then encourage the children to come up with their own proud statements. As they say their proud statement have them approach the string, and since their nose is in the air, have them trip over the line ( you may want to put pillows on the other side). Reinforce to the children that proud people are so focused on themselves that they can't see the dangers ahead of them. You can also have them take turns saying humble phrases like, "I feel really pretty today, and you look pretty today too" or, "Wow, I got that shot, thanks for helping me get it." When they say humble phrases have them look around the room and avoid the trip line. This activity can also be done using stuffed animals or dolls. Just make the trip line about knee height for the stuffed animals you are using. Another variation is to put glasses covered with dark paper or a blindfold on the child and have them walk and try not to trip. You can explain that pride makes you blind but when we are humble we can see the needs of others and what God wants us to do. “You’re really not quite as big as you think! There are quite a few others who could eat you for lunch! After everyone else replies with God’s lines, the next person thinks up an animal slightly larger than the previous one. For example, the flea could be followed by a spider. The game continues until the creatures named are as large as dinosaurs. You can use puppets, stuffed animals or pictures as a visual for each of the animals/creatures you name. When the game is finished, take a minute to point out that God is bigger and more powerful than all of the creatures named. The lepers were unable to help themselves and when they asked Jesus for help He had compassion on them. He told them to go and show themselves to the priest and then they would be healed. All ten lepers went to the priest and afterwards they were all healed. To say thank you the lepers would have had to go back and find Jesus and express their gratitude. Out of all ten lepers only one leper was willing to go to the effort to find Jesus again and thank him. Stress to the children that sometimes showing gratitude is not easy, but that when we do we gain more blessings from God, just like the leper who came back did. Why did only one leper go back and say thank you? How do you think this made Jesus feel? How do you think the leper felt after he said thank you? Have you ever forgotten to say thank you to someone after they did something nice for you? What can you do to help you remember to say thank you? Keep a gratitude Jar. 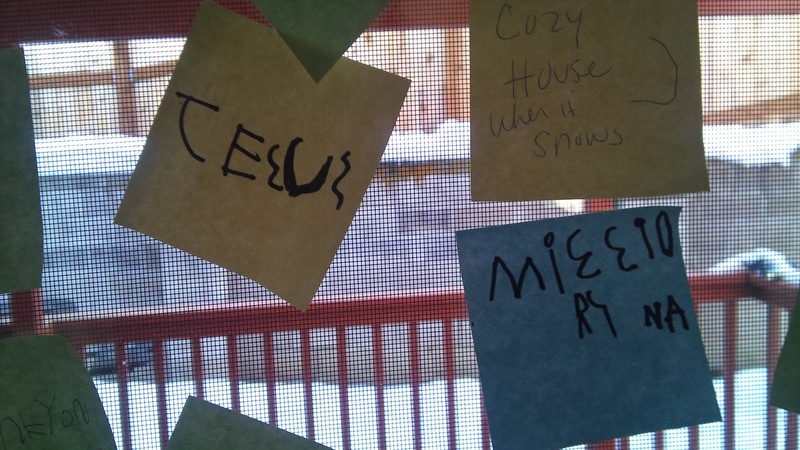 Have children write things they are grateful for on slips of paper and have them put them in a mason jar (or another large type of jar). Keep it out all month (or all year) and have them add things they are thankful for. Open it up and read the slips occasionally as a reminder. It is also fun to spend time decorating the outside of the jar with things the kids are grateful for. Make a long list of everything that you are grateful for. You could use a cash register roll and see who can make the longest list. Keep it up all month and have the children add to it so that it grows and grows. This is also a fun idea to do on Thanksgiving, and every year see if you can get your list longer than last year's list. Children can draw pictures if they are too young to write. Make a gratitude wall or gratitude tree. At every meal have a pens and a pile of sticky-notes available on the table. 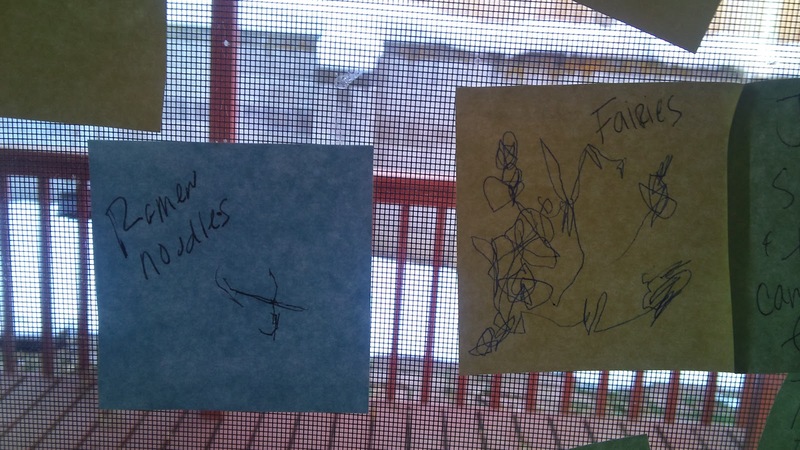 Before eating have every member of the family write (or draw) at least one thing they are grateful for on a sticky-note. 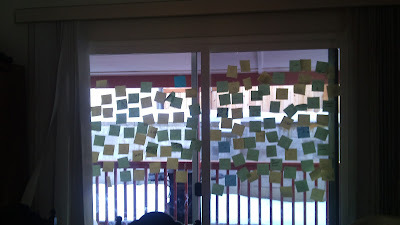 Stick the notes on a wall or create a "gratitude tree" somewhere in your house where you can stick or hang the notes. When we did this we used the sliding doors in our dining room. Our goal was to have the whole door covered by the end of the month and we did! Well, at least the top half that the baby couldn't reach and pull off. There are many people who perform thankless jobs that make your child's life easier. This could be a teacher, janitor, librarian or someone who organizes a community event. Start by helping your child identify these selfless people in his life. Next, provide materials for your child to create thank you cards to give to these people. Helping your child see how he benefits from others humility, can help him become more humble too. Give your children each a gift bag and have them run around the house to find one ‘gift’ to give each other. They don't have to be real gifts, just objects, toys, books, clothes or something that they think the other person might like. Remind them that it should be something that they own and that they won't mind if they don't get back. When everyone has found a gift to give take a moment and talk about the correct way to give and receive gifts. Explain that when they open each other’s presents they must 1) thank the person and 2) say something nice about the gift... even if it is something silly or something that they don't like. It may help if you model for the kids by opening a gift first yourself and showing them how to respond gratefully. Kids usually love this game, so play it until they loose interest. Explain to the children that Jesus taught us the correct way to pray. Read through the Lord's Prayer and help them identify the different parts of a prayer. It may help to have children draw a picture of each of these steps and have them posted some place where they can see them when they pray. Esther had a big choice to make and she was afraid that if she made the King angry she would be killed. Esther was afraid but she had faith that God could help her. Before she made any decisions she asked all her friends and the rest of the Jewish people to pray and fast with her that she would be safe. When Esther approached the King he was kind and loving and when he heard her concerns he wanted to save her people. She knew that the Lord had heard her prayers. Just like Esther we can pray to God when we have big choices to make, and we can ask others to pray with us too. Why do you think Esther asked everyone else to pray with her? Have you ever had a time when you had a problem you couldn't fix? How do you know that God hears your prayers? Show the kids pictures of real (current and historical) Kings, Queens, Princes and Princesses. If you can find story books about them even better. Talk about how people show respect to these rulers by kneeling before them. Have one of the children dress up like a king or a queen and sit on a "throne." Have the other children pretend to be subjects and approach the king or the queen. When they approach have them kneel and bow their heads when they ask them for a favor or a gift. Let each child have a turn being the king or the queen. You can also have the kids see what happens when the subjects approach and don't treat the king or queen humbly. Is the king or queen as willing to listen to them and give hem what they ask for when they don't ask humbly? Explain that God and Christ are more powerful than any of these rulers and that we kneel to show our respect. Remind them that when we pray to God we bow our heads and kneel to show our respect and love for them. Teach children that Naaman was a rich and powerful man and that the little maid was a poor and powerless servant. She showed courage in approaching Naaman's wife and bearing testimony that she knew the prophet Elisha could help him. Sometimes when we have great trials (like the leprosy that Naaman had) it makes us more humble, and Naaman showed humility by being willing to listen to her and follow her advice. Even so, when Naaman heard Elisha's advice his pride took over and he didn't want to follow the prophet. Luckily Naaman repented of his pride and obeyed and was cured of his leprosy. What do you think made the Little Maid bear her testimony about Elisha? Why do you think Naaman didn't want to do what Elisha asked him to do? What happened when Naaman did obey the prophet? Have you ever had times when you didn't want to do something you were told? Why not? How do you make things better when you make mistakes? Prior to beginning the experiment, create a stain on the cotton cloth using the berry juice. Invite your children to try to wash the stain out using water. (Bath time is an ideal time for this activity!) Point out that the berry stain is like sin; no matter how hard we try, we cannot get rid of sin on our own. Next, place the stained cloth on a cookie sheet. Have your children pour lemon juice on the stained area, one teaspoon at a time. As you do so, explain that the lemon juice represents God’s power. Read 1 John 1:9 and rinse the fabric with water. Explain that our job is to confess our sins and that God is the one who purifies us (or washes our sins away). You may need to pour hot water through the fabric if it is a tough stain. Could you wash the stain out using your own strength? How do we get the dirt off the outside of our bodies? Can we wash our insides? What did get rid of the stain? Who does the lemon juice represent? What do we need to do to get rid of our sin? What is the difference between a proud person and a humble person? Get a large piece of paper and help the children draw two trees on it. One tree will represent pride and the other will represent humility. At the base of one tree, write “pride.” For pre-readers, it’s helpful to replace the “I” in pride with an illustration of a human eye. Explain that the “I” in “pride” stands for living life as if it’s “all about me!” A proud person thinks and says things like, “I’m the best;” “I know everything;” “I am more important than you.” Remind your children that what we do comes from what we think. The “fruit” in our lives is our actions. Just like a tree grows fruit from the water and food that comes from the tree’s roots, the way we act is rooted or based on what we believe. Wanting the best for oneself. Refusing to share with others. Refusing to say, “I’m sorry” and unwilling to ask forgiveness. Refusing to admit faults or wrongdoing. Overly upset when losing at a game. Refusing to take advice or being unwilling to listen to others. After you have a good list of behaviors show the kids a fresh banana and explain how it represents the fruit of the pride tree. Get a strait pin and as you read the list of proud behaviors the kids have pasted on the tree poke the banana with the pin. You can make them big pokes, and even wiggle it around inside the banana a bit so that it mushes up inside. Tell the children that you are going to leave the banana out on the table (or wherever) for the next week and tell them to watch what happens to it. Willing to let others go first. Willing to say, “I’m sorry” and ask forgiveness. Lets little things slide instead of getting upset with others. Being willing to accept advice and listen to constructive comments. After you have a good list pasted on the tree bring out another fresh banana. Explain that this banana represents the fruit of the humility tree. Get a wet washcloth and as you read the list of humble behaviors wipe the outside of the banana. Leave it on the table next to the "pride" banana and tell the children to observe what happens to each of the bananas over the next week. Hopefully, what will happen is that the "pride" banana, the one with the pokes, will start to get brown and ugly faster than the "humility" banana. At the end of the week you can open up the bananas and look at the inside of the fruit and see that the "pride" banana is more rotten than the "humility" one. Explain to the children that if we don’t have Jesus’ help, our "natural man" will lead us to grow “rotten fruit.” If we want to produce “Jesus fruit,” then we need to ask His Holy Spirit to live in us and help us to live and love others like Jesus did. When we do grow Jesus fruit, God is pleased and others find us much more pleasant to be around. Let your children know that even if you make proud choices, and have rotten fruit, that you can always change and become better. Tell them that you will watching them for good choices. When you notice them making good, humble choices instruct that child to pick one piece of rotten fruit off the tree and put a fresh fruit on the other tree instead. The goal is to get all the rotten fruit picked off and replaced with fresh fruit. Remind them that Christ wants all of us to be good, fresh beautiful trees and that each of us can through His love and power. These are awesome, Heather! Thank you! THIS is exactly what I knew I needed but didn't know how to find! I am homeschooling my Kindergartener and Preschooler, (plus baby), and have been wanting to incorporate the gospel/virtues/character traits into our school day. You are awesome!! Loving these posts of yours...we've been using Preach my Gospel as one of our main family study tools the last year and I love it so much. When I suggest it to others they seem intimidated (which it is SO not!) but I can totally send them here for child friendly adaptations. You're the best. I got on here to tell you that I read Zion's Hope the past week (about the first midwives and female doctors in Utah) and I thought of you...hope your move and all is going well! AMZING! This is exactly the thing for which I am looking on internet. And finally, I got it here. I must say that you posted great thing for every parent. Hats off to you!